For ladies looking for the new girls’ night out idea, brides looking for a “blooming good time” at their bridal festivities or any men looking to improve their flower arranging skills, Kimpton Hotel Eventi now offers a “Bouquets & Bubbles” Brunch with Celebrity Florist Michael Gaffney and his New York School of Design. Guests will learn how to make stunning floral arrangements with Gaffney while enjoying brunch and mimosas, catered by French-trained Executive Chef Laurent Tourondel. The “Bouquets & Bubbles” Brunch starts at $285 per person, with a minimum of 15 people, and includes a two-hour flower-making session and brunch, along with a mimosa and bellini station. To reserve a “Bouquets & Bubbles” Brunch, call 212-564-4567. 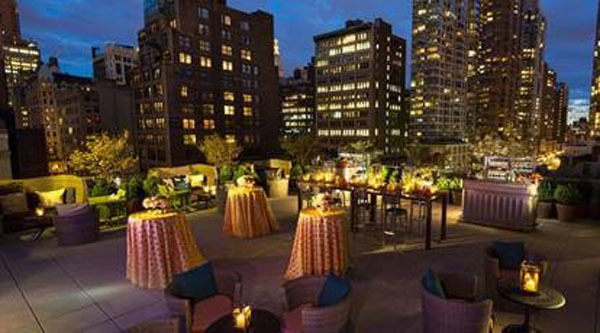 Kimpton Hotel Eventi this summer is offering, for the first time, a rooftop event space with a new, elegant retractable tent on their terrace and a “Rain or Shine” package. I’m not sure of any other NYC hotel that offers a private event space like this with a tented option. 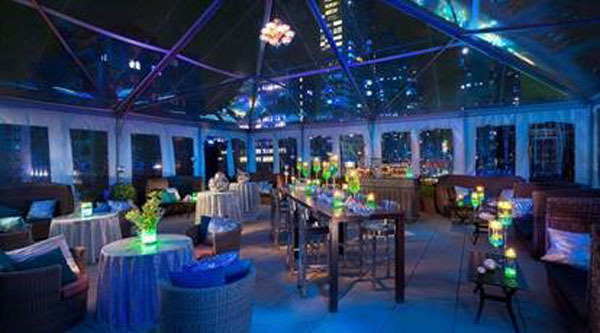 Called, “The Veranda,” the stylish space is versatile for any event, with breathtaking views of the Empire State Building. Hotel Eventi offers catering packages, including an open bar and extensive dinner menu for guests. Catering is overseen by Chef Laurent Tourondel, with delicious cocktail hour small bites such as grilled octopus with crushed fingerling potatoes, or steamed bao buns with crispy shrimp and pickled jalapeño. Along with cocktail dishes, the package includes a selection of delicious stations, such as a slider station with seven peppercorn-crusted sliders and lamb sliders with fig jam. Guests can also choose from a risotto station, and indulge in cacio e pepe risotto or white truffle risotto.